Hello. I'm Rory Chasen. I've visited Killer Characters before, around the time the first book about me, the first Superstition Mystery Lost Under A Ladder, was published last October. I thought solving the murder described in that book would be the end of such things, but it turns out there'll be a new book that describes yet another murder I have to get involved with. It's called Knock on Wood and I'm told it will be published this October. What's it about? Well, my very good friend Gemma Grayfield recently moved to Destiny, California, the town all about superstitions where I now live. She was a librarian back in L.A. but now she is running the Broken Mirror Bookstore, the shop next to the Lucky Dog Boutique that I currently manage. Something went wrong and Gemma is accused of killing someone. That's too much like the prior situation in which my boss and friend Martha Jallopia was accused of committing a murder. Martha's a new friend but Gemma's been my buddy for a long time, so of course I have to help her, too. What happened? Well, Gemma showed up here in Destiny a day earlier than I expected her because she was fleeing her prior boyfriend Frank Shorester, who wound up following her here. Gemma is a good looking and really nice lady, and a couple of other guys showed interest in her as well: Stuart Chanick, who edited the definitive book on superstitions, The Destiny of Superstitions, as well as Lou Landorf, the Public Affairs Director of Destiny. And then P.A. Director Landorf is found dead. Gemma is the person deemed the primary suspect by the police. That includes Police Chief Justin Halbertson, who's kind of my beau here despite my determination not to get interested. That's because my initial reason for coming to Destiny was to learn the truth behind superstitions, since my beloved fiancé Warren died soon after walking under a ladder, and I just don't know if I'm ready yet, or ever, for another relationship. In any case, I have to help Gemma by learning who really did kill Lou. My lucky black and white dog Pluckie helps me investigate, of course. Will I be successful this time? For Gemma's sake, I certainly hope so. 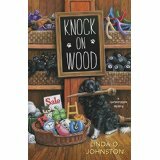 KNOCK ON WOOD, the second Superstition Mystery by Linda O. Johnston, will be an October 8 release from Midnight Ink and is available for pre-order now. Knock On Wood sounds like a great mystery. I am looking forward to reading it. Congrats on your soon to be released book! Of course you have to help your friend! Gemma was there for me when Warren was lost after walking under a ladder, so I definitely need to be there for her under difficult circumstances. Very true, Willow. Even though I really like the police chief, that doesn't mean he or his department are right all the time. I have Lost Under a Ladder. Glad there will be another book in the series.